The ever-present Richard Gere has been finding audiences since his arrival on the big screen in 1977. Directors have placed him in a wide variety of roles, where he always makes a good accounting in each film. Born in Philadelphia, Gere is decended from passengers on the Mayflower. 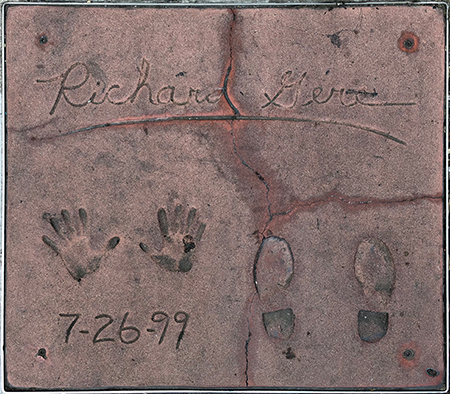 Moving to the New York area, Richard attended North Syracuse Central High School, where he excelled at gymnastics and music. Attending the University of Massachusetts at Amherst on a gymnastics scholarship, Gere dropped out to persue acting. He spent time at Seattle Repertory Theatre and at the Provincetown Playhouse, then he drifted down to New York, where his musical chops got him a part in the rock opera Soon, co-starring Barry Bostwick, which unfortunately flopped in January, 1971. A year later, Gere was the catch-all male understudy (including for Barry Bostwick's Danny Zuko) in the first New York production of Grease, beginning in February, 1972. He was chosen to take on the lead role of Danny in the first London production of Grease, in June, 1973. Just then, Gere's first television appearance on Chelsea D.H.O. aired over ABC. Returning to New York, he was cast by acting guru Milton Katselas, who was directing the crime picture Report to the Commissioner (released in February, 1975) with Michael Moriarty. In November, 1975, Gere was on Broadway once more in the comedy Habeas Corpus, with Celeste Holm. Gere had a small part as a Marine Raider in Baby Blue Marine (released in May, 1976) with Jan-Michael Vincent, then captured a lot of attention as a hyper-physical murdering one-night stand at the end of Looking for Mr. Goodbar (released in October, 1977) with Diane Keaton. Directors started coming around. Terrence Malick cast him as the lead in his Days of Heaven (released in October, 1978) with Brooke Adams; veteran director Martin Ritt put him in Bloodbrothers (released in September, 1978) with Paul Sorvino, and John Schlesinger cast him in his personal project Yanks (released in November, 1979) with Lisa Eichhorn. As Yanks was being released, Gere undertook the role of Max in the Broadway previews and first six months of the run of Bent. During this run, director Paul Schrader's film with Gere, American Gigolo (released in February, 1980) with Lauren Hutton came out; the film was a success, with Gere now riding very high. Director Taylor Hackford put him in An Officer and a Gentleman (released in August, 1982) with Debra Winger, which became a huge hit. Director Jim McBride put him in a remake of Breathless (released in May, 1983) with Valérie Kaprisky, which sort-of flopped. Director Francis Coppola put Gere in the lead for his ill-fated The Cotton Club (released in December, 1984) with Gregory Hines. Director Bruce Beresford put him in the title role of King David (released in March, 1985) with Edward Woodward as Saul. Director Mike Figgis put him in his cop mystery Internal Affairs (which played the Chinese in January, 1990) with Andy Garcia, which did well, and became a hit on video. Then director Garry Marshall put him with Julia Roberts in what became Gere's biggest hit ever: Pretty Woman (released in March, 1990). Financially, it has become the most successful romantic comedy ever. Director Phil Joanou cast Gere as a psychiatrist in Final Analysis (which played the Chinese in February, 1992) with Kim Basinger. Director Jon Amiel put him in a remake of The Return of Martin Guerre called Sommersby (which played the Chinese in February, 1993) with Jodie Foster. The film is an acquired tatse. Director Roger Spottiswoode cast him as The Chroeographer in And the Band Played On aired over HBO in September, 1993 with Matthew Modine. Director Jerry Zucker put Gere in as Lancelot to Sean Connery's King Arthur in First Knight (released in July, 1995). Director Gregory Hoblit cast Gere as an attorney in Primal Fear (which played the Chinese in April, 1996) with Laura Linney, then director Michael Caton-Jones put him in as the lead detective in his remake of The Day of the Jackal called The Jackal (released in November, 1997) with Bruce Willis. Reteaming with director Garry Marshall and Julia Roberts, Gere cemented his reputation as a rom-com lead in Runaway Bride (released in July, 1999). For Robert Altman's comedy about a gynocologist, who else but Richard Gere? Dr. T & the Women (released in October, 2000) with Helen Hunt, came and went, as they say, but when director Rob Marshall cast him as Billy Flynn in the musical Chicago (released in December, 2002) with Renée Zellweger, Gere finally returned to his musical roots and wowed everyone. Gere played Patrick Henry in an episode of the star-studded Freedom: A History of Us aired over PBS in February, 2003, then had the lead in Shall We Dance? (released in October, 2004) with Jennifer Lopez. He played Clifford Irving for director Lasse Hallström in The Hoax (released in April, 2007) with Alfred Molina, and was recruited by director Todd Haynes for I'm Not There (released in December, 2007) with Cate Blanchett. Director Mira Nair put him in as husband to Amelia (released in October, 2009) with Hilary Swank as Amelia Earhart; he starred as a hedge fund executive in Arbitrage (released in September, 2012) with Susan Sarandon; he became a new character living at The Second Best Exotic Marigold Hotel (released in March, 2015) with Judy Dench, and he played a fixer for director Joseph Cedar in Norman (released in April, 2017) with Lior Ashkenazi. Downshifting, he led the ensemble cast in director Owen Moverman's The Dinner (released in May, 2017) with Laura Linney, and director Jon Avnet cast him as a psychiatrist in Three Christs (released in September, 2017) with Peter Dinklage. Mann's Chinese Theatre, Hollywood, California. 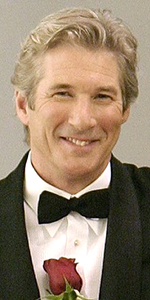 Richard Gere Forecourt ceremony, Monday, July 26, 1999. 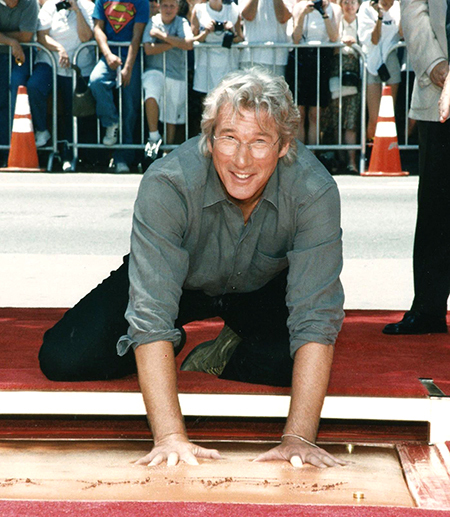 Richard Gere gives the camera a smile as he places his hands in the wet cement.